Good similarity functions are at the heart of effective case-based reasoning. However, the similarity functions that have been designed so far have been mostly linear, weighted-sum in nature. 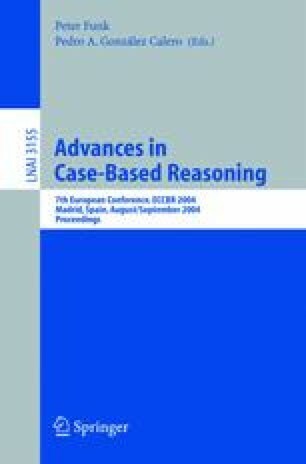 In this paper, we explore how to handle case retrieval when the case base is nonlinear in similarity measurement, in which situation the linear similarity functions will result in the wrong solutions. Our approach is to first transform the case base into a feature space using kernel computation. We perform correlation analysis with maximum correlation criterion(MCC) in the feature space to find the most important features through which we construct a feature-space case base. We then solve the new case in the feature space using the traditional similarity-based retrieval. We show that for nonlinear case bases, our method results in a performance gain by a large margin. We show the theoretical foundation and empirical evaluation to support our observations.